Tradeshows are important events for any organization to attend. They bring people together through the bonds of complementary business goals, allowing new relationship sand networks to form seamlessly, often resulting in big rewards down the line. In fact, the ROI in attending tradeshows speaks for itself. But, what you may not have known is that approximately 99% of marketers said they found unique value at tradeshows that they did not get from other marketing mediums. Tradeshows are a great opportunity to interact and connect with customers, partners and prospects within similar business avenues. 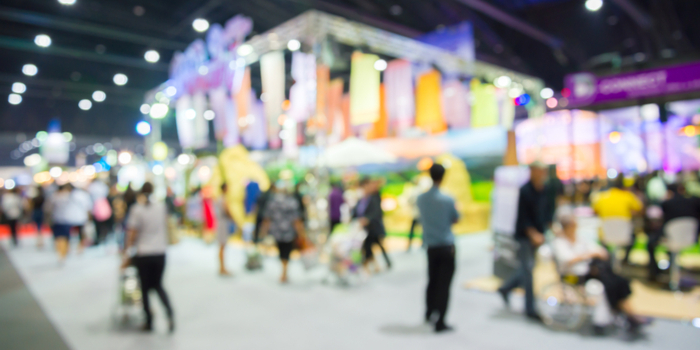 So, by now you’ve probably realized that the benefits far outstrip the costs when it comes to tradeshows and you’ve officially decided to attend one. What next? It’s time to start ideating on ways to draw people in to your booth at the tradeshow. You want to create a spectacle, generate some buzz, so to speak, but the competition for attention on the floor is fierce. Keeping people interested means keeping your booth lively. One way to do that is by offering distinct promotional products, possibly through guided competitions or giveaways. Likely many other vendors will think to bring branded merchandise, but if the products offered at your booth are both unique and useful, you’ll get the impressions to match. To stand out from the clutter of the tradeshow floor, you need to produce a stand-out experience for your visitors. And promotional gifts aren’t the only way to do this. Think booth design, booth placement, eye-catching advertising and more. You could sponsor a specific event or host a training session. Even having your attendees in noticeable, professionally branded company attire can bring your name equity at the event. With the right preparation and creative, branded solutions, you'll be the star of the (trade)show! Need inspiration on how to create a memorable tradeshow experience for attendees? We’ve got tons of content on unexpected and exciting items for every budget, perfect for tradeshow giveaways.